From June to September each year, monsoon rains fall in southern Asia. The rains are crucial to agriculture, but at the same time pose hazards to crops, homes, and people. Floods often submerge fields, destroy buildings, and contaminate drinking water. By late July 2011, the downside of monsoon rains was apparent in parts of India and Nepal, as both countries coped with displaced residents and casualties. This image shows estimated rainfall amounts from July 10 to 16, 2011. 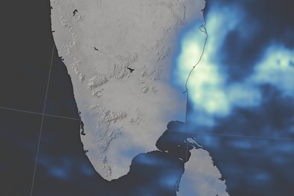 The lowest rainfall amounts (less than 50 millimeters, or 2 inches) appear in pale green, and the heaviest amounts (more than 400 millimeters, or 16 inches) appear in dark blue. Floods and landslides result not just from rainfall but also from other factors such as land cover and topography. Places that receive less rain may actually suffer more serious consequences. 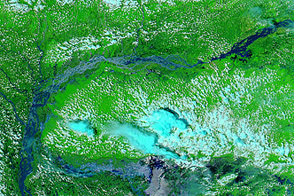 Although this image shows higher precipitation levels in western India, some of the most severe damage reports came from the northeastern Indian state of Assam. On July 20, Hindustan Times reported that heavy rains washed out roads and breached embankments in that state. On July 18, AlertNet reported than hundreds of villages had been inundated. Heavy precipitation caused trauma to other parts of the region as well. Heavy rains pushed dams to their limits in the western Indian state of Gujarat, according to Hindustan Times. Meanwhile, AlertNet reported that 73 people had died and another 25 were missing in Nepal. In India and Nepal, about 200,000 people had been forced from their homes. The heavy rains in India and Nepal threatened to push rivers over their banks. The flood-prone Brahmaputra River was dangerously high, and authorities were watching the Kosi River, which abruptly changed course in 2008, in the wake of heavy rains. This color-coded map shows precipitation amounts over India, Nepal, and the surrounding region July 10 to 16, 2011. 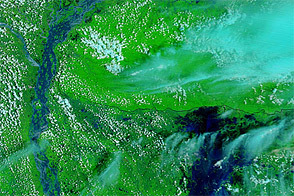 Heavy rains caused floods in parts of India and Bangladesh in July 2011. Das, B. (2011, July 18). More than 200,000 hit by floods in India, Nepal. AlertNet. Accessed July 21, 2011. HT correspondents. (2011, July 20). Brahmaputra above danger mark, Assam sounds alert. Hindustan Times. Accessed July 21, 2011.